Deciding what business message you want to convey. Websites are not static, ideally they should change and grow with your business. We build online content management systems that allow you to update your website as easily, if not quite so often, as you change your socks. Additional features can be added on request and if you already have an existing website we can integrate an online content management for you. And we've saved the best news for last, all of this won't cost you half as much as you think it will. You may want to sell your goods online and we can set up an ecommerce site to suit your exact requirements. One of our specialities is writing accessible websites. 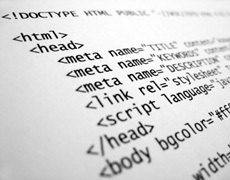 We can address your website's accessibility as well as optimise its structure and HTML for search engines. We are happy to host and manage websites whether or not we have built them. If you'd like to discuss your requirements, simply give us a call - 07774 742 048. "These guys seems to make everything possible and deliver on time and to the highest standards. No one else took such a care of us and our work. Great stuff!"